Every time a player wins a hand with a royal pocket pair they are awarded a freeroll ticket to the nightly €10,000 Royal Crown Freeroll. A royal pocket pair is any pair of face cards that the player receives in the initial deal (pocket jacks, pocket queens and pocket kings). 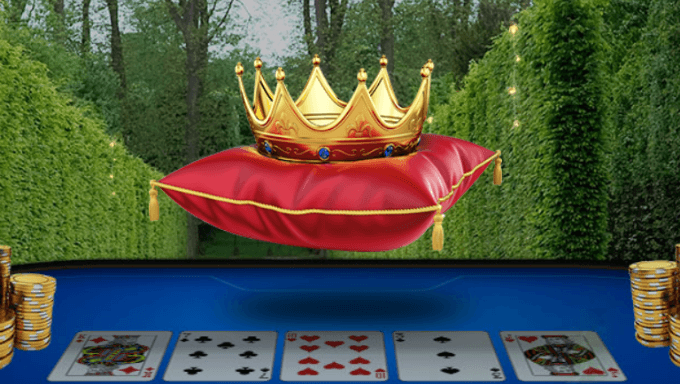 To win the ticket players must win the hand with the royal pocket pair while playing any cash game €0.02/€0.05 and higher, any tournament with at least €1 buy-in and BLAST when playing with at least a €1 deposit. Aside from winning cash on the spot from the free roll itself, there are scratch cards awarded that provide the opportunity to win up to €500,000. These are given out when a player wins a hand with a royal pocket part while taking part in the Royal Crown Freeroll. Participants are guaranteed at least €1 in winnings with an 85.9779 percent chance of that being the result. They’ll have a 12 percent chance to win €3, a 2 percent chance to win €10, a 0.02 percent chance to win €100, a 0.002 percent chance to win €1,000 and finally 0.0001 percent to win the life-changing grand prize of €500,000.